On your wedding day hundreds of pictures with you will be taken and you have to make sure that you look your perfect. When you look back at these pictures you want to see a groom with a perfect outfit. 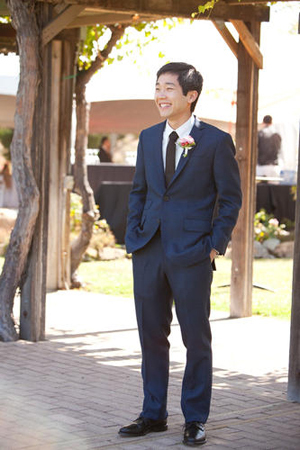 Depending on your body conformation there are different styles of groom’s suits that will work in your advantage. Here are the groom’s attires for each body conformation. 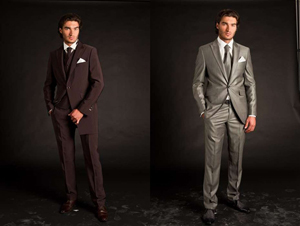 If you are tall and have a thin conformation you are one of the lucky grooms that can wear any contemporary suit styles. From jackets with a single row of buttons, to jackets with 4 buttons, or with 2 rows of buttons, each of them will be a good fit for you. If you are very thin and you want to look a little more corpulent you should opt for an arched jacket with two rows of buttons and broad shoulders. Also make sure that your jacket’s sleeves are long enough. 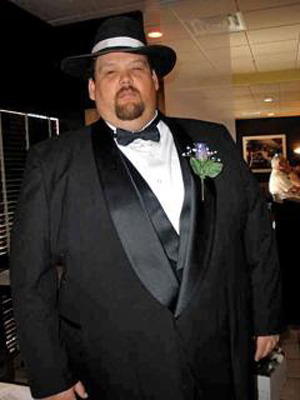 If you are a tall and corpulent groom you need a simple suit, with no details on it. The jacket’s collar should be rounded to create an elegant line which will make you look thinner. Avoid jackets that have double rows of buttons and pleated shirts as they will add some volume. If you are a large size you should opt for vest instead of belt, as the vest will hide your waist. Keep in mind that black makes you look thinner and that it would work in your advantage. You should not choose white or light shades of colors for your groom’s attire.If your body conformation is made of masses of mussels, especially around your neck, you shouldn’t opt for a bow. You should go with a tie instead, but make sure the tie is not thin. If you are a short and thin groom you should opt for a wedding suit with a jacket that has a single row of buttons and vertical lines that will make you look taller. The lapel of your jacket should be wide. Also make sure that your tailor emphasizes the shoulders and hides the waist. You can also opt for a three button jacket. If you are a short and corpulent groom you will look good dressed in a jacket with a thin collar. The jacket should have a single row of buttons. The first button should be located on the thinnest part of your waist. Also you should opt for a vest instead of a belt. Kindly send me a catalogue of all Groom attire you have. There is a special suit i found in your website but now cannot locate.